Thanks for helping us kick things off! 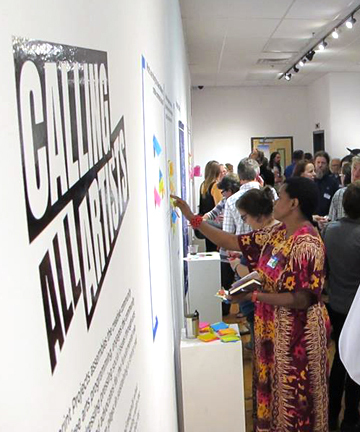 Our Calling All Artists launch event was a great success and we owe a huge thanks to all the folks who came out, participated, and gave us such a warm, Waltham welcome. Special thanks also goes to Mayor McCarthy and members of City Council for joining us, to the Estate of Susan O’Malley for allowing us to show the artists work, the Campos-Borsatto Duo for their fabulous music, and to our volunteers and generous sponsors, including Lincoln Arts Project, Newtonville Camera, Inc., Nickerson and Hills Inc., and Brothers Marketplace - Waltham. Together we identified over 25 arts and cultural organizations, institutions, museums, and festivals, two major universities, and three well established studio buildings that are the home to over 90 artists working in Waltham. In addition to these assets, you identified multiple places on our map where you choose to create, which includes home studios, co-working spaces, schools, etc. We wanted to know how we can continue to strengthen the arts and culture landscape in Waltham, and learned a lot about what you need to better support your practice. You shared that Waltham boasts diversity and affordability, key ingredients that provide ideal working conditions and attract creativity. Though, you also indicated that Waltham is lacking resources to sustain and develop your artistic practice, or equitable and visible opportunities to enrich all of our communities. You’ve given us a lot of great ideas to think about. What’s one thing that makes Waltham’s creative community unique? 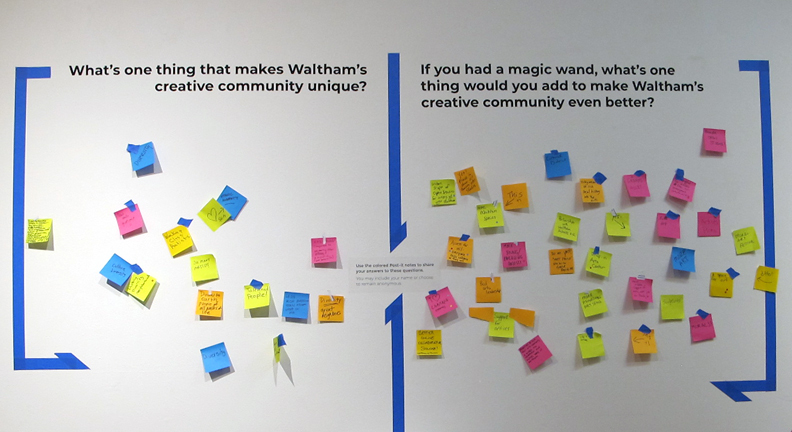 If you had a magic wand, what one thing would you add to make Waltham’s creative community even better? More support for artists from our immigrant and LGBTQIA communities. What’s one thing you might NEED from Waltham’s creative community to better support you? What's one thing you can CONTRIBUTE to make Waltham's creative community even stronger? We asked that you cast your vote for initiatives you would like to see here in Waltham and the results are in. If you were unable to attend this event, you can still take part! Take a few minutes to complete this survey to give us a better sense of who you are and what you need to continue your creative practice here in Waltham.